EDINBURG, Texas (Oct. 10, 2018) – The Rio Grande Valley Vipers, single-affiliation NBA G League partner of the Houston Rockets, today named Joseph Blair as head coach. Blair becomes the seventh coach in franchise history. Blair is in his fourth season with the Vipers, having previously served as an assistant coach dating back to 2015-16. “After spending the last three years in the valley, I’m honored to be a part of something that represents such a wonderful community and prestigious organization. Looking forward to the season, I also consider it an honor to be the first coach to christen Bert Ogden Arena. I’m excited to feel the energy of the new arena and the Viper fans! I’m hoping to set the bar extremely high for any coach that might end up filling my position in the future, just as it was done before I took the reins,” Blair commented on his excitement of taking the reins of the Vipers. Prior to joining the Vipers, Blair spent two seasons at the University of Arizona, where he served as an undergraduate assistant (2013-14) and as a graduate assistant (2014-15). Blair was the 35th overall pick by the Seattle Supersonics in the 1996 NBA Draft. He played professionally from 1996-2009, primarily throughout Europe. While playing for Scavolini Pesaro in the Italian league in 2002, Blair earned All-Euroleague Second Team honors. In 2003, he was named Euroleague regular season MVP while playing for Ulkerspor in the Turkish league. Blair also had two stints with the Harlem Globetrotters, once coming in 1997-98 and the other in 2001. In his four seasons as a player at Arizona (1992-96), Blair averaged 10.4 points, 6.5 rebounds and 1.1 blocks while shooting 61.3% from the floor. The Wildcats twice won the Pac-10 regular season championship during that span and advanced to the NCAA Final Four in 1994. Blair remains the Wildcats all-time leader in career field goal percentage and ranks eighth in blocks (110). Season tickets for the Vipers 2018-19 season are on sale now. 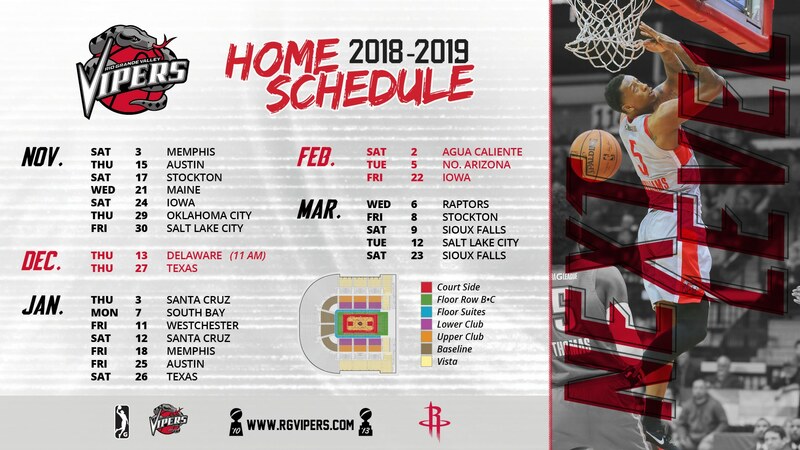 Opening night for the Vipers tips off on November 3 against Memphis Hustle at 7 p.m. (CDT) at Bert Ogden Arena. Tickets for November and December games go on sale Wednesday, October 17 and will be available at Bert Ogden Arena or www.rgvipers.com.